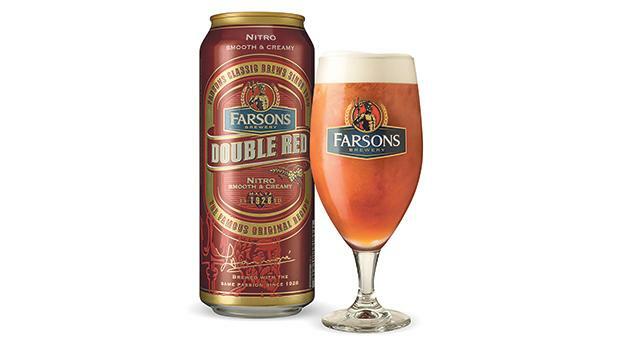 Following the successful launch of Blue Label Amber Ale Nitro Smooth & Creamy in a 44cl can last year, Farsons Brewery has now launched Double Red Strong Ale in a Nitro Smooth & Creamy version, also in a 44cl can. Part of the Farsons Classic Brews beer portfolio, Double Red Strong Ale is brewed with high-quality ingredients sourced specifically by Farsons brewers for this brew. With an ABV of 6.8 per cent, Double Red has a deep ruby colour and strong character flavour coming from the roasted malt used at mashing stage in the brewing process. This strong flavour is complemented nicely with a slight hoppy bitterness and balanced out by a malty sweetness in the aftertaste. This flavour profile makes the beer a perfect companion to hearty stews and grilled red meats. Double Red also pairs excellently with desserts such as dark chocolate, almond cakes and tarts. The Farsons Classic Brews brand also includes Blue Label Amber Ale, India Pale Ale and the most recent addition, Gold Label Pale Ale launched earlier this year to mark the Farsons Brewery’s 90 years of brewing. The beers are brewed, packaged and distributed by Simonds Farsons Cisk plc. Farsons Double Red Nitro Smooth & Creamy in a 44cl can is available at major supermarkets and retail stores in Malta and Gozo. Follow Farsons Classic Brews on https://www.facebook.com/FarsonsClassicBrews or visit www.farsonsclassicbrews.com.